It’s been just over two weeks ago that the very first Quantified Self conference took place at the Computer History Museum in Mountain View California. If you don’t know what the Quantified Self is you can learn more on my initial post about the site here. But the cliff notes version is that the group was formed to discuss devices and other methods of generating and tracking personal data to help optimize our health and behaviors and share that knowledge. Some devices you may be familiar with that can be used for lifelogging (or self tracking) are Runkeeper, Nike +, Fitbit, and an item I reviewed recently called the Bodymedia armband. I’ve created a page that I continually update that lists some of these items here. 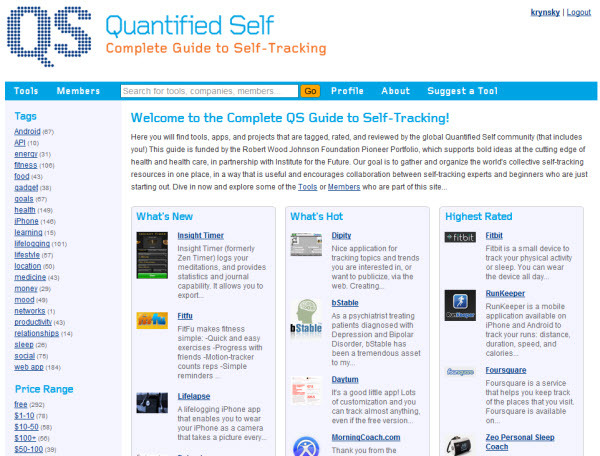 One of the results of the conference has been this new site which provides a complete guide to self tracking by the Quantified Self group. This is an excellent resource for someone who has interest in learning more about the devices and services available which can also be filtered by various categories and price ranges of the products listed. They provide the ability to add tools and the site is also building a community of users by allowing people to create profiles and review tools as well. This should turn out to be a great resource moving forward. I really wanted to attend this but unfortunately wasn’t able to make it. I did however track much of the discussion thankfully to all the Tweets coming out from the conference. There were also some posts written on the Quantified Self site recapping the conference. I feel that the best coverage from the conference however was written by Ethan Zuckerman who liveblogged a great deal while there. One of his posts was covering the discussion of context behind the Quantified Self conference provided by one of the group’s co-founders Kevin Kelly. We’re in the middle of a third paradigm of metaphors and organizing principles for personal computers. We’ve moved from desktop and office metaphors, to page/link and web metaphors, to a new metaphor around streams, tags and the cloud. RSS feeds, Facebook walls, Netflix streams are our general drift at present. This accompanies a shift from the me to the we, and from pages and files to data. What emerges in this new model are Lifestreams. That’s what we curate in the age of the quantified self. We head upstream, and we leave a wake of data behind us. Lifeloggers, who log everything they do, are pioneers in this space. Gordon Bell and others take these exercises to an extreme, and they’re sharing it, as part of the shift from me to we. These lifestreams intersect with each other and are, in a way, creating a new media. If we organize computation around lifestreams, an intersection between our lifestreams is a communication, an event of some sort. The media we are in is these streams of data. Everything around us has a sliver of intelligence in it, and is generating bits of data. Each of those objects has a lifestream of data, from the hotel room to your shoes. This environment, with data streams and life streams, is the space where we’ll do the work of the quantified self. I was excited after reading this because it provides a broad paintbrush by using both the terms Lifelogging and Lifestreaming. Kevin provides the distinction between both the data we’re generating by our behaviors online along with the tracking of personal activity. I’m glad that he discussed this all encompassing aspect of personal data generation and didn’t limit the aspects of what the Qauntified Self can provide. There’s quite a bit more to what Ethan covered and you can read the rest of his post on Kevin Kelly here. Lastly Ethan wrote another post with his reflections on the conference in which he provides more context regarding his inclusion at the conference and views as an outsider looking in. It’s another great read and although I disagree with his skepticism on the ability for concepts being generated by the Quantified Self going mainstream, he does a great job of dissecting and getting better understanding of it.